So how do waterfalls get formed? Answering this question is really a lesson in geology (the study of rocks or the earth) and the water cycle. But before we get into those topics, let’s first walk you through the waterfall formation process. 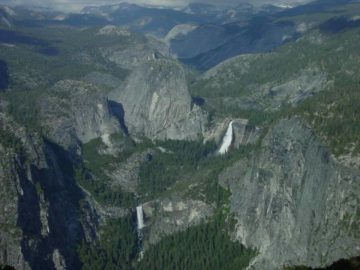 Waterfall formation is based around the basic principle that there is a watercourse (realize that water is an erosive agent) traversing over different layers of rock each with different rates of erosion. 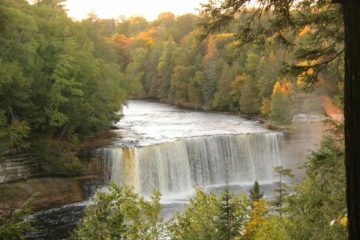 In other words, you have a river or stream flowing over hard rock (where erosion is slow) and also flowing over soft rock (where erosion is more rapid). Over time, the soft rock is further cut into by the water ultimately making the watercourse steeper beyond the hard rock layer. This steepening effect also accelerates erosion as the influence of gravity on the water increases the water’s speed (thanks to the increasing slope as a result of the accelerated erosion). 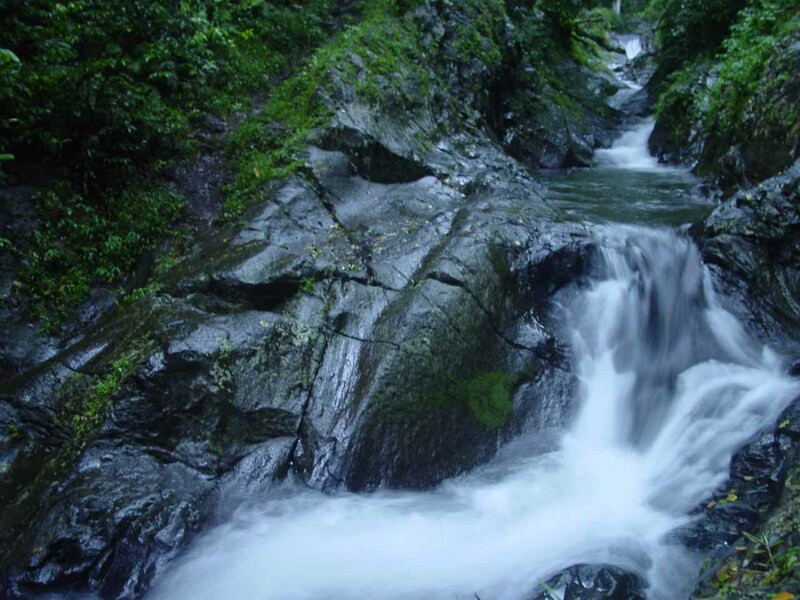 Typically, cascades and rapids, like the Waitavala Water Slide in the Fijian Island of Taveuni, are at this stage of waterfall development. Eventually, the watercourse steepens until it’s either nearly vertical or completely vertical. At this point, you have a bon-a-fide waterfall! 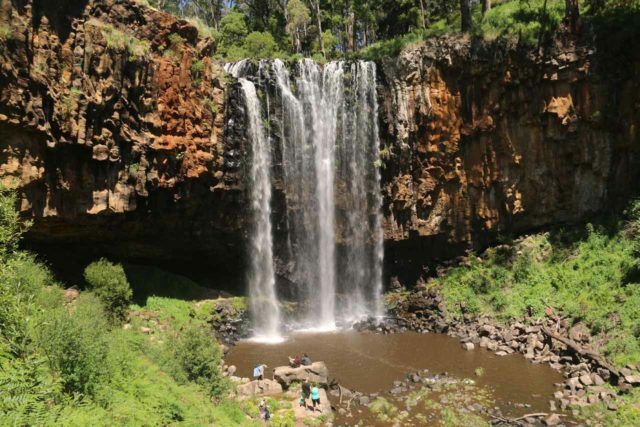 With the watercourse continuing to cut into the softer rock, the waterfall gets taller, the plunge pool (where the waterfall lands) gets deeper, and the soft rock directly beneath the hard rock gets undercut. 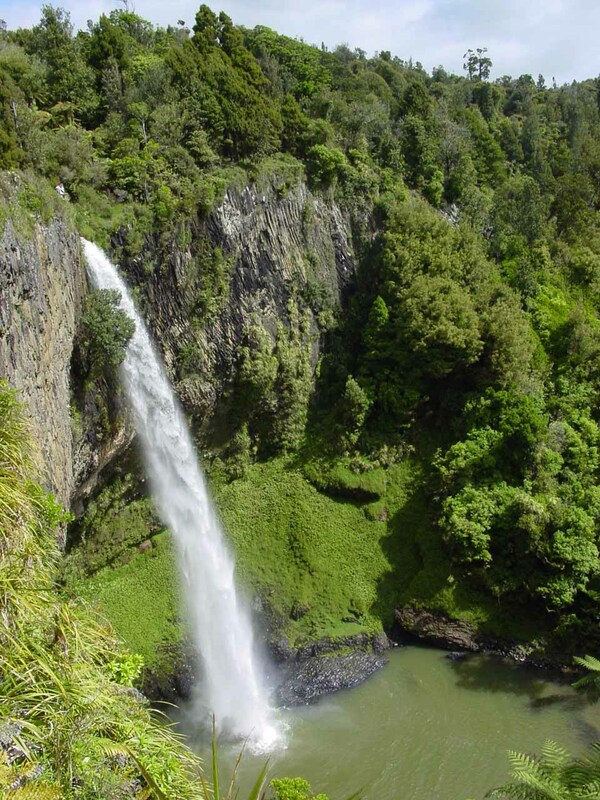 Bridal Veil Falls in New Zealand, I think, is a pretty good example of a waterfall at this stage. 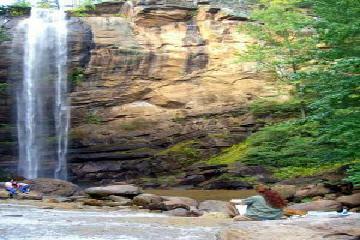 In the photo, notice how the watercourse plunges from the cliff and doesn’t even make contact with the cliff wall! This suggests that the hard rock layer is overhanging. So it’s the undercutting action that results in waterfalls where you might be able to go behind it! 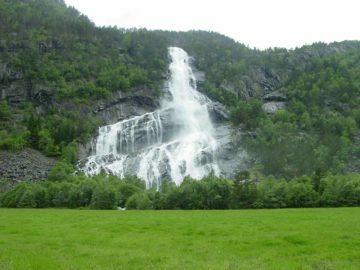 Waterfalls such as Steinsdalsfossen in Norway are examples of such a waterfall in the advanced stages of development. As the undercutting continues, eventually the overhanging hard rock becomes unstable and top heavy. 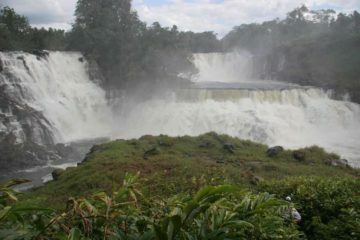 Ultimately, a chunk of that erosion-resistant hard rock layer collapses and falls into the base of the waterfall. 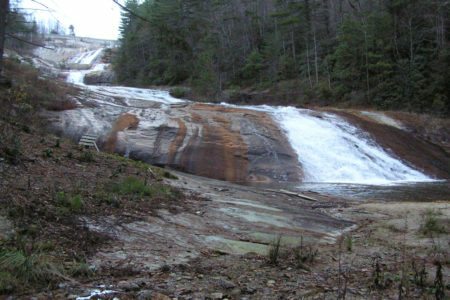 The net result of this action is that the waterfall retreats further upstream to the remaining lip of the hard rock layer. 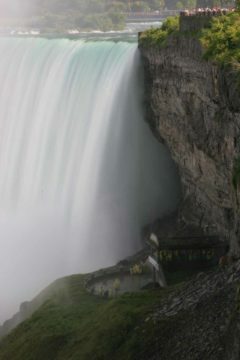 With its high volume of waterfall, Niagara Falls continues to retreat at a whopping rate of about 3 feet per year! In the adjacent photo, look at the overhanging wall in the photograph, which is further evidence that this process is still going on! The undercutting still continues until you run out of the hard rock layer. At that point, the watercourse will probably go back to being a stream or rapid. 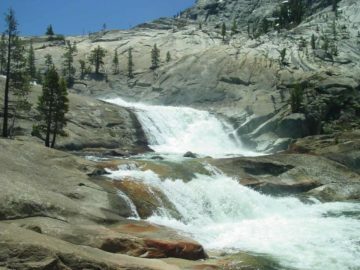 Now while these processes highlight the fact that things as seemingly permanent as waterfalls can come and go over time, these same processes also take many, many years to occur. So it’s going to be a while before you see Niagara Falls retreat to the point of disappearing. Indeed, when you’re talking about geologic time scales, you’re talking on the order of millions of years or more! Heck, even things that took thousands of years to occur are like a blink of an eye in geologic time scales! 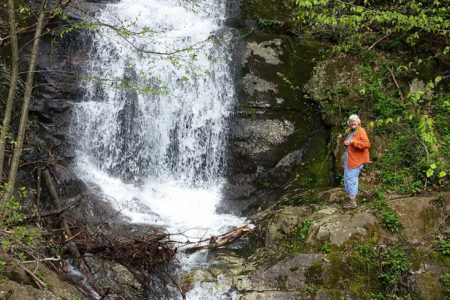 You’re probably more likely to see waterfalls disappear in your lifetime by man-made causes than letting Nature take its course. In any case, I made an attempt at capturing the waterfall formation process in a single drawing to further help you visualize it. However, if you’re more of a hands-on person, you can demonstrate at home or at the local park the waterfall formation process explained above. To do this, make a fairly large sand pile. This sand pile represents the soft rock layer. Then, insert a board or anything relatively flat and hard with some degree of thickness (the thicker the better) somewhere into middle of the side of the sand pile. This hard, flat material you’ve just inserted represents the hard rock layer. Finally, pour water onto the slope of the sand pile (the same side you inserted the hard, flat item) and observe the water flow over the sand and hard object. If done right, the water should be flowing down the slope of the sand pile eventually cutting into it. The water will flow over the hard object before falling over its edge and back onto the rest of the sand’s slope. The water will cut into the sand below the hard object and it’s this part of the moving water that ultimately results in the waterfall. If you run this experiment long enough, you should be able to form your own little waterfall! 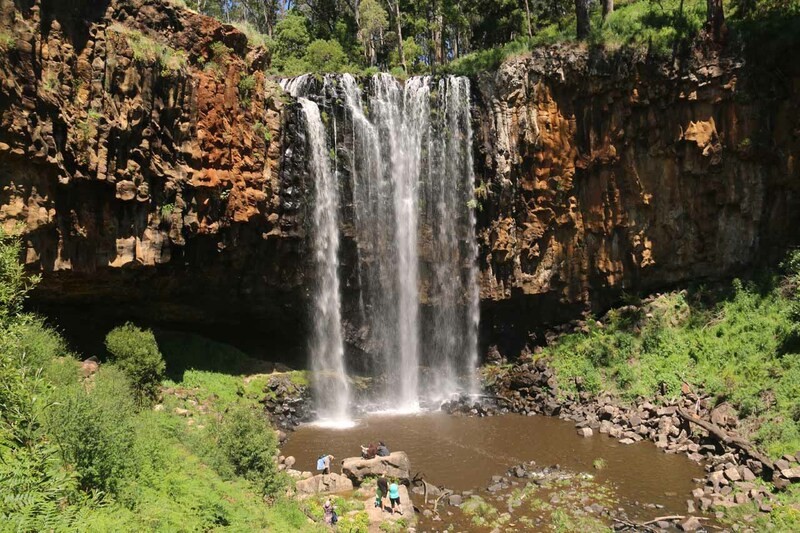 Once you accept the idea and science behind the waterfall formation, you might be able to imagine how you can end up with different shapes or types of waterfalls simply by varying the orientation and combination of hard and soft rock with water cutting through them. Now you may be wondering how all the different rock layers got there in the first place and why these rock layers erode at different rates. Well, just about all of the land you see around you is the result of volcanoes. Volcanoes typically spew out lava, which is really molten rock (or rock that is so hot that it acts like a liquid). When the lava is on the cooler surface (instead of the heat within the earth’s surface), the lava becomes more solid. 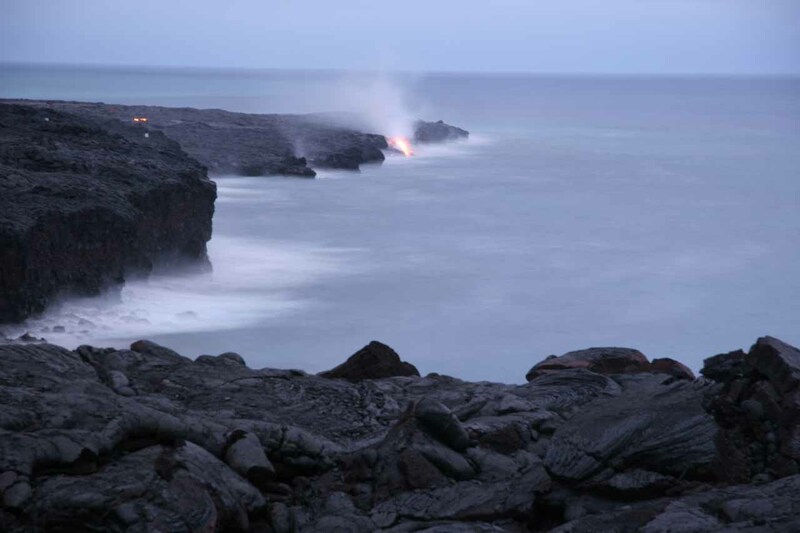 You can see this action taking place in places like the Big Island of Hawaii, where the lava ultimately solidifies to add to its landmass and become part of the rock layer. Other volcanoes spew out lava that doesn’t flow as fluidly as those in Hawaii. That fact alone illustrates that the rock layers that form from the cooling lava can have differing compositions. And its this differing composition that results in the differing levels of resistance to erosion by water (and to a lesser degree wind). In addition to differences in the composition of the lava and/or rock layers depending on geography, it’s also possible to have differing rock layers accumulating over millions of years as geologic processes may evolve over time. 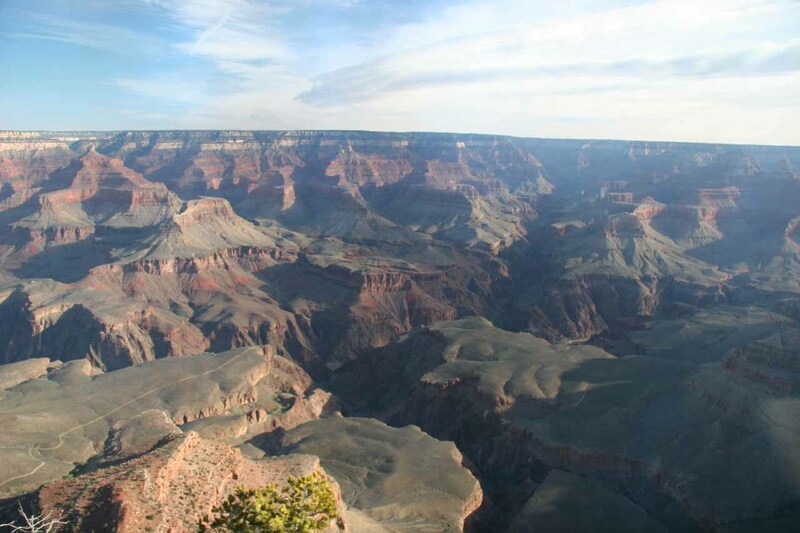 Places like the Grand Canyon in Northern Arizona exemplify such geologic episodes as the Colorado River exposed and revealed the many layers of rock holding up the majestic cliffs and buttes. Each layer represents a change in the geologic conditions. It could be a volcano going off depositing a layer of new lava, or a major event like an asteroid collision depositing a thick soot and dust layer (e.g. the dinosaur extinction event), or the advent of a new species changing the chemistry of the atmosphere and/or the biosphere, or a countless number of other things taking place in the past. In any case, volcanoes are a regular aspect of the earth’s geology, and they’re a consequence of the earth letting out its internal heat. The internal heat of the earth also is the engine behind convection, which moves the molten rock beneath the crust. And this, in turn, drives big chunks of the earth’s crust (or tectonic plates) to move. Some of these plates slide against each other, others collide, and still others separate from each other. There are even hot spots that practically tear heat holes through the crust (like the ones that formed the Hawaiian Islands). Bottom line is that these factors are what gives rise to the various rock layers as well as features we see like mountains, valleys, drainages, flatlands, and more! It’s no secret that you need water to have a waterfall. But where does that water come from? Below is a simplified diagram (perhaps too overly simplified) of the water cycle. This is the dominant source (perhaps the only source) of all inland freshwater. Even though the earth is nearly 70% water, the vast water supply is stuck at sea level in the oceans. 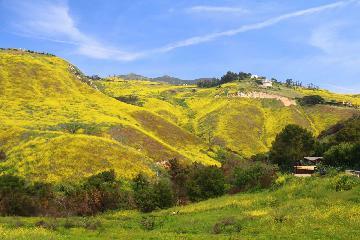 So how does water get into the higher elevations on land? 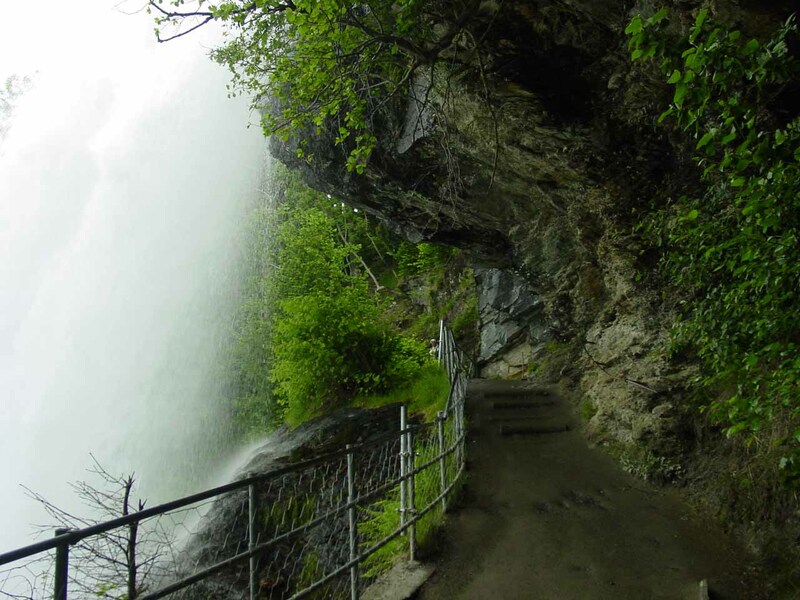 After all, you need elevation to even have a waterfall drop, right? Well, the sun’s energy essentially turns liquid water molecules into water vapor (or water molecules into a gaseous form) in a process called evaporation. This process, by the way, is the very process that separates all the salt and other things with the water from the water gases themselves resulting in the drinkable freshwater. The water vapor (by a process I don’t fully understand) eventually coagulates or comes together in the form of clouds. Then, the clouds can move inland according to the whims of air currents, the rotation of the earth, and other poorly understood atmospheric events. When the water vapors rise up against mountains, plateaus, or an updraft, or runs into a cold air mass, the clouds get cooler and the water gases condense as mist, rain, or snow (or for a fancier term: precipitation). As the water precipitates from the sky, gravity takes over and the water collected on land ultimately drains back into the oceans. Now that you know how the water cycle works, keep this in mind the next time you see industrial waste, sewage, or other junk that gets flushed out into the oceans. Guess where all that junk goes! That’s right, it goes stays in the oceans where most of life on earth exists! So that’s just something else to worry about as Global Warming deservedly gets all the headlines, but the impact of our activities on the food chain might be the pink elephant in the room! Anyways, that’s another topic but at least the water cycle sheds some light about this very troubling issue. Finally, let’s delve deeper into how the water moves from mountains to oceans. When water precipitates from the sky, the liquid (rain) or solid (ice/snow) water collects on the ground. The water then descends to lower elevations while carving out channels that become watercourses such as rivers, streams, brooks, springs, etc. 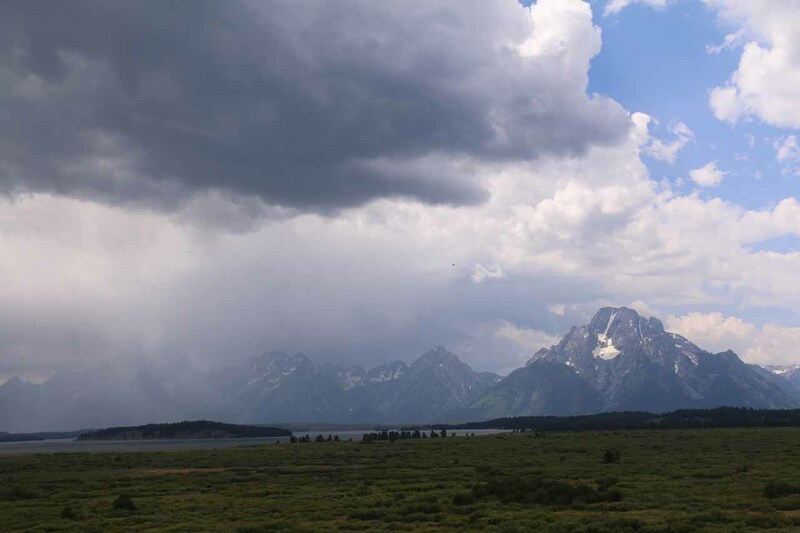 The places where the precipitation collects and drains towards the watercourses are called drainages or watersheds or water catchments or basins. You can think of drainages as a sort of tilted funnel where the output of the funnel is your major river that has collected all that water and melted snow or ice and is sending it all back to the ocean. If the watercourse just so happens to cut through differing layers of rock with at least one of the layers being harder than the rest (as described above), then you have a waterfall! So what determines the distribution of precipitation? That’s dependent on climatology and meteorology (in other words, climate and weather). Unfortunately, the atmosphere as well as its interaction with the earth’s geology is immensely complex. Delving deep into this topic to try to gain an understanding is beyond the scope of our discussion. 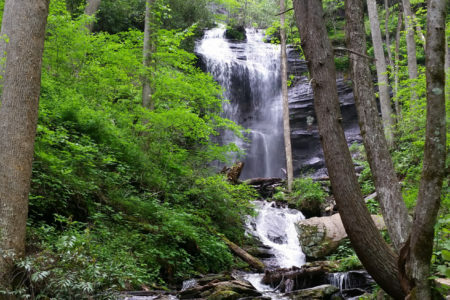 What Types Of Waterfalls Are There? 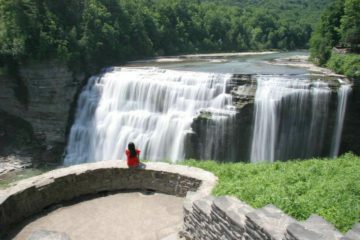 When Should I Visit Waterfalls? What Makes A Waterfall A Waterfall? How Do You Measure A Waterfall’s Height?